Lately I've been thinking about designing some dungeons intended to be played in one session with some low level pregen characters, just a quick one-and-done thing for my friends, some combat and puzzle-solving. I might edit an existing d20 system to simplify it a little, something like that. A mix of pnp and board game, to an extent. It'd take some tweaking. Basically, if you have 70 XP, you might decide to invest in three ranks of damage (for a cost of 60) and one rank of to-hit (for a cost of 10), and end up with +3 damage and +1 to hit. The +1 HP and full heal is sort of a fall back thing, if the chips are down and you have some extra XP, you might decide to dump some in there for a health refill (between battles only). 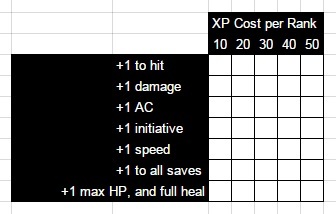 I'd plan on something like 250 XP for each player over the course of the dungeon, so you could get a full +5 to one stat and +4 to another if you focused, or spread it out a bit more and get four stats to +3, etc. Do you see any major problems with this? What do you think of the balance of relative benefits here? Is it pretty bad, like nobody in their right mind would ever take anything but + to hit? Has anyone run math on various d20 systems before and figured out generally how valuable these stats are in relation to each other? Maybe it should be +2 to damage to make it more worth investing in by comparison to AC, or something. I know overall it depends on how combat-heavy the module would be, vs. if there are a lot of traps or skillful bits. And honestly it's not going to be that big of a deal if it's just individual sessions, it's ok if things get a little broken since it's not meant to be long-term. I just wondered what other pnp players would think of something like this. Are there already some well-designed rapid leveling systems out there that would work better than this? What else could I add? +1 to all of this character's invested skills? Any ideas for caster benefits? I think everything there is still beneficial to them. Casters doing more damage or hitting more often is still useful. Or getting to go first. I wouldn't think you'd need to add anything else to be beneficial. This really depends on what you are throwing at them. If a +1 damage takes them from 6 damage to 7, that's a 17% increase in damage, versus a +1 AC/Attack only being a +5% chance of hitting/getting hit. If that +1 damage takes them from 20 to 21, it's definitely weaker than from 6 to 7, but is still probably useful. So, it just depends on how you balance the PCs/NPCs as to whether a +1 damage is in line with a +1 attack/AC. Thanks for the reply. Yeah, that makes sense, and goes with what I was thinking earlier, that I might want to tweak the game and characters a bit so that stat increases can be relatively similar to each other in value. Or also along those lines, if characters deal about 6 damage and a lot of the enemies have about 10 HP, then the first couple investments in damage won't necessarily be that helpful, since it's still taking two hits to kill. Or if they deal 6 damage, and there are a lot of minion type enemies with 1 HP. If the goal is one-and-done gameplay, then maybe you don't even need to track XP. Perhaps set up a series of milestones in your dungeon, and when the PCs reach such a point, they get to choose a benefit from your list. This also means that you don't have to worry as much about combat vs skill content, since you'd be able to decide at exactly what points the PCs become more powerful. It might be more interesting to provide a selection of 4 or 5 feats for a character to choose from after every other fight, customized for the character. I find larger tangible bonuses like that more satisfying than raw stats, and the limited selection keeps from slowing down the game.